Home > Episode 1,221: Whose “Raw Strength” Has Luke Seen Only Once Before? Episode 1,221: Whose “Raw Strength” Has Luke Seen Only Once Before? 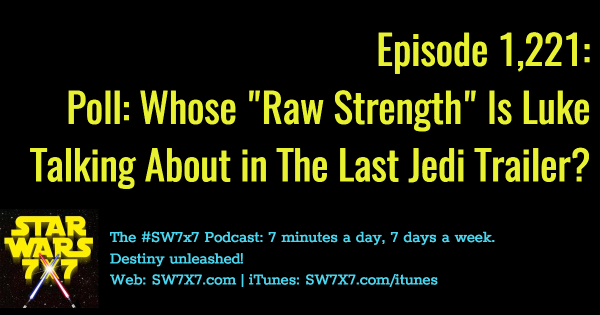 That’s Luke Skywalker himself, Mark Hamill, all scared of “raw strength.” What’s up with that? First off, I think we’re all pretty sure he’s talking to Rey at that moment in The Last Jedi trailer (although it’s been suggested by other speculators he’s talking to the Force ghost of Yoda). But whose raw strength is frightening Luke? It sure seems like Kylo Ren/Ben Solo is the obvious answer, but I wanted to cast a wider net of opinion. So I put it out there as a poll to a couple of Star Wars Facebook groups. Other potential options: Vader, Palpatine, Snoke, Yoda, and even Rey herself, as a little girl. Again, perhaps not unsurprisingly, Kylo got the lion’s share of the vote, with Vader coming in a distant second. A couple of folks wrote in Luke himself as the one with the raw strength, which is certainly a fascinating possibility. But I can’t imagine Rian Johnson going with that solution somehow.